Con Job: Stories of Adjunct and Contingent Labor describes and makes visible the pedagogical, economic, and ethical costs of higher education’s growing reliance on adjunct and contingent faculty. Armed with a borrowed video camera, Megan Fulwiler and Jennifer Marlow, two teachers of composition, set out to record the voices of faculty who are often invisible in and marginalized by the institutions where they teach. Our film features interviews with contingent faculty from across the nation, as well as with labor activists and leading figures in the field of Composition and Rhetoric. Ultimately, the film calls on the field of Composition to use its collective rhetorical strength to challenge the current state of exploitative labor practices in writing instruction. Given both the scope and complexity of contingency, we have chosen film as a medium with the power to provide a visible portrayal of the lived material conditions of labor in higher education and to reach as wide an audience as possible both within and outside academe. Fulwiler, Megan, and Marlow, Jennifer. 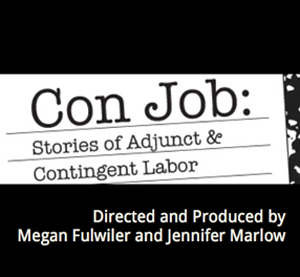 Con Job: Stories of Adjunct and Contingent Labor. Logan, UT: Computers and Composition Digital Press/Utah State UP, 2014. Web. Copyright © 2014 Megan Fulwiler, Jennifer Marlow, and Utah State University Press/Computers and Composition Digital Press. Some rights reserved.